Today developer Arabane87 has released a new homebrew named Project Void v0.1.0 for the Playstation Vita. Check out the release notes, changelog and the download link provided below. 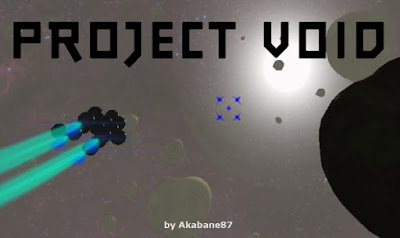 This project aims to be a space opera focused on dogfights. The way you build your spaceship using different modules such as engines, canons and so on, will impact the momentum and the whole physics that will make your ship move and react: Any module will have independant resistance and detroying a module will affect the physics of the ship until you repair it. AIs now use both missiles and standard blaster shots. AIs will completely stop if their generator is destroyed, and will use inertia if the engine recalibration is not possible. Disable canons and thrusters when the generator is destroyed. Make the recalibration button only available when a recalibration is possible. Add a volume balance control for each sound data for balancing the sounds. Integrate sounds for blaster shot, missile shot, blaster impact, missile explosion, module explosion, and thrusters. Add a spatialized sound system to the sound player to handle 3d sounds correctly (pan and doppler effect depending the speed). Replace forces by impulses to stop beeing framerate dependant. Add canon gauges to the HUD and change the HUD disposition. Prevent the engine recalibration to cut all engines when the recalibration is impossible. Optimize a bit the asteroid fragment shader. Add a batch renderering system for asteroids (this shifted the high CPU consumption to the GPU without any gain of FPS...). Fix a weird bug on vita's flare rendering where the flare could sometime blink randomly (no idea what really happened...). Add a draw order for sprite rendering, to force the rendering order instead of using the center position depth (used for HUD elements always to be in foreground). Add frustrum culling for the particle emitters (per sprite). of your ship when fired. The generator will refill energy constantly when you stop firing. If the generator is destroyed, no more energy will supply your ship, making your engines and weapons stop working.